Specialized's Turbo Cotton clinchers are some of the best tyres that I've ever had the pleasure of riding. The supple casing and Gripton rubber compound combine to give a fast and smooth ride that is perfect for racing. As a bit of a tyre nerd, I do love getting fresh rubber to test. Tyres are the finishing touch to the bike and they can really change the feel on the road, especially through and out of corners. A bad set will impair even a top-end bike so this is one component that I am happy to invest in. People usually cite rolling speed and resistance in watts when they're challenging me as to why I still use classic-looking tyres like these. They'll tell me just how much faster tubeless is, but the Turbo Cotton is no slouch. For those who like the numbers, the Turbo Cotton scored a resistance of 10.1w when tested by bicyclerollingresistance.com. Compare that to the new Continental GP5000 TL at 8.3w and the Vittoria Corsa Speed LTR, currently the fastest measured by BRR at 7.7w. Put simply, you won't be losing tangible speed by using these tyres. I set these up with Continental's Race inner tubes. Despite the flat shape, they mounted really easily, with the supple casing helping the final section of the bead to pop over the rim without the use of a lever. I popped mine up to 80psi and headed out on the local B roads to test the suppleness of that cotton casing. The lack of road buzz is enough to suggest that the 320tpi casing works very well. The softer casing might be more comfortable but the trade-off is usually puncture protection. I've not punctured these, and as they're more of a summer tyre you'd hope there's even less likelihood of finding yourself deflated, plus they do have some protection in the form of Specialized's BlackBelt technology. I've been using Challenge's Strada tyres which have a similar cotton casing so far this winter and the only thing to puncture them was a stray nail. As this is a race tyre, I took them up to the closed circuit at Odd Down. The tarmac here is smooth and I know it well, having raced far too many laps during evening crits. It's also the perfect place to test the cornering ability of tyres as a slight downhill straight leads into a tight left-hand hairpin. Taking the speed up gradually, I soon felt comfortable cornering at race speeds on slightly damp tarmac. The Gripton compound provides plenty of grip and it hasn't been wearing out like my old Vittoria Corsa SC tyres used to. The sidewalls are also holding up very well, despite having been used in the rain. Tan sidewalls can easily stain but the Turbo Cotton seems to have been treated with something that is repelling the water. They're probably still best saved for racing and summer use, but you don't need to spare them from occasional exposure to wet weather. It's nice to see that these beautiful sidewalls will stay perfect for many miles. Weight is pretty decent at 240g (26mm). That's 20g more than the Continental GP5000 and the same weight at the Vittoria Corsa G+. I doubt I could feel a 20g difference, and it's certainly not holding the tyres back out of those Odd Down hairpins. The width is true to the stated measurement on my Fulcrum Racing Speed 40C wheels. They have an internal width of 17mm but the tyre width may well change on different wheels. The big issue for many will be the price: £61 per tyre is a lot of money for a component that will likely only last one season. At RRP, these are not much more expensive than a similar Vittoria Corsa G+ clincher (£56.99) or Continental's new GP5000 (£59.99). The drawback is that although you can currently get them a bit cheaper online (£55, if you follow the link below), they're nowhere near the discounted price of those Vittorias, which you can find for £34.99. That said, I'm more than happy to highly recommend these tyres. They're up there with the old Vittoria Corsa SC as the nicest clincher that I've ever ridden, and they seem to be better at resisting wear. If you've got a top-end bike then these will complement it beautifully. Specialized says, "We're not afraid to say that our GRIPTON® compound is the best out there. And when combined with an ultra-supple 320 TPI cotton casing, you get a tire that's very special''you get the Turbo Cotton tire. Both materials stand for master craftsmanship, and they work in harmony to reflect our dedication to building the world's fastest tires. By bringing both of these materials together, we've created the best clincher tire out there. It provides a clear-cut performance advantage." These are really well made. The casing has been treated to protect it against water ingress and the tread lines up perfectly. Fast in a straight line and through the corners. These aren't going to last you the huge number of miles that a harder tyre will, but they're wearing well for what they are. 240g is pretty good, especially given the more classic construction. Not bad for a top-end clincher and the resistance to wear is better than some that I've used. Perfectly. These are a fast, grippy and light race tyre. Cornering grip is really very good. About the same RRP as other high-end clinchers. Absolutely perfect performance with that classic look. If they were a bit cheaper than the Vittoria Corsa G+ then they'd get a perfect 10. I've always thought that "fast" and "grippy" were mutually exclusive. Well a non gripy tyre would never be fast as you have to factor in all the extra time spent picking yourself up from the ground. I’ve never understood why manufacturers use strong colours on things like tyres. 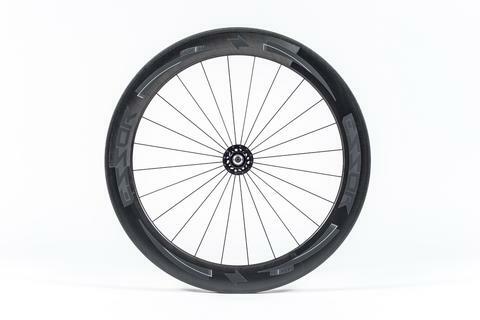 I’ve heard that Turbo Cottons are great, would love to try some, but would I buy them over other fast tyres? No, because they have a massive red logo on them, I have nothing else red on my bike, the colour would clash. I can’t be the only one? But red is fast, and Specialized's red is formulated to add an extra 5 watts. You'd be crazy not to buy them. Actually, I really like the look of them. Might have a pop.